Fresno, CA: Even though one of the state's largest gay rights organizations has decided to wait until 2012, gay rights supporters in California are gearing up for a 2010 ballot initiative to repeal the statewide ban on gay marriage. 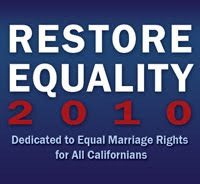 In order to get on the ballot, Restore Equality 2010 will have to collect nearly 700,000 signatures. Although the state's largest gay rights group isn't on board just yet, local organizers are confident they'll come around once the signatures are gathered.